Paul Grimm was born in South Africa and moved to the United States at the age of seven. From an earlier age he showed great aptitude as an artist, gaining a scholarship to the renown Düsseldorf Royal Academy. In 1919 he found his way to Hollywood and then in 1932 he made his permanent home in Palm Springs, where he lived until his death in 1974. 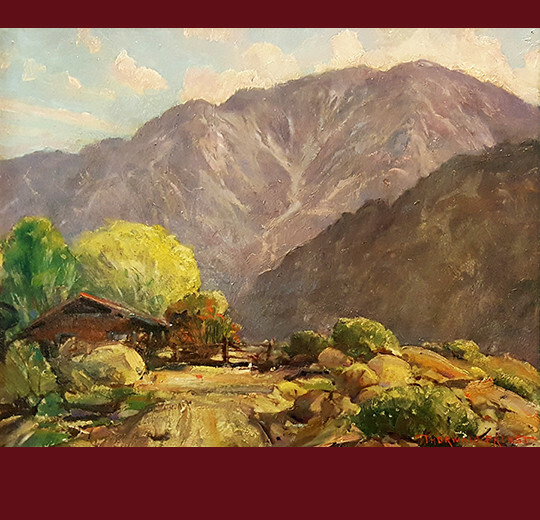 Paul Grimm painted numerous images of the California landscape but is best known for his powerful depictions of the California desert and the mountains surrounding Palm Springs. This work is no exception to his ability to capture the power and magnificence of our world here. Frederick William Becker was born in Vermillion, South Dakota. He studied at the Pennsylvania Academy of Fine Arts, at the School of Art & Design as well as at schools in Los Angeles and San Francisco. He lived on both coasts, as well as in Oklahoma and even in Taos, New Mexico. Quite the traveler, Frederick painted actively and his landscapes were known for their color and strength. He remained most active in California and lived in the Palm Springs region till his death in 1974, in Cathedral City. 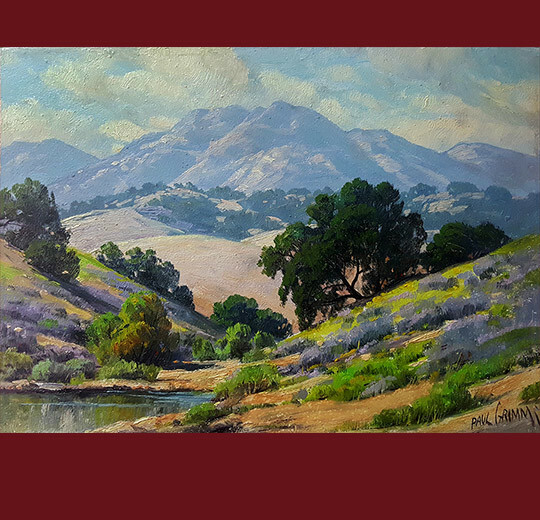 Born in New York City, Dedrick Stuber became a renown California painter that specialized in capturing the light and vibrancy of the landscapes found here. He loved to paint “plein air” and would start quite early, at dawn, when the air and light was fresh. He moved to California in 1920, although he likely painted here as early as 1915. He painted a variety of subjects, and his works always have a sense of otherworldly romanticism. 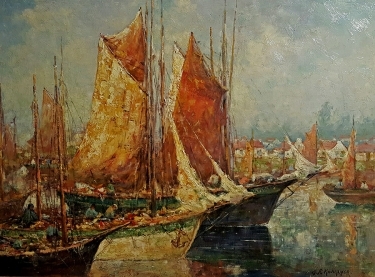 He was an accomplished painter of seascapes and marine subjects, however he is best remembered for his pastoral imagery. Stuber died in Los Angeles on Aug. 18, 1954. 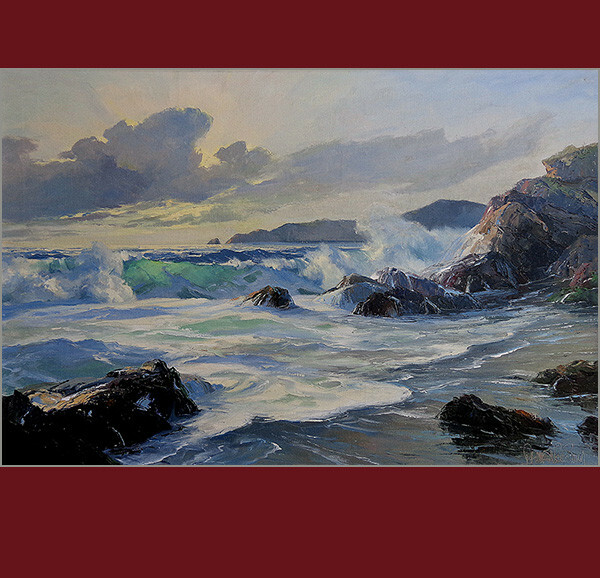 Charles Rollo Peters has often been called the “Prince of Darkness” for his many nocturnal paintings, particularly of the Monterey region of California. Peters studied with artist Jules Tavernier and also at the California School of Design. 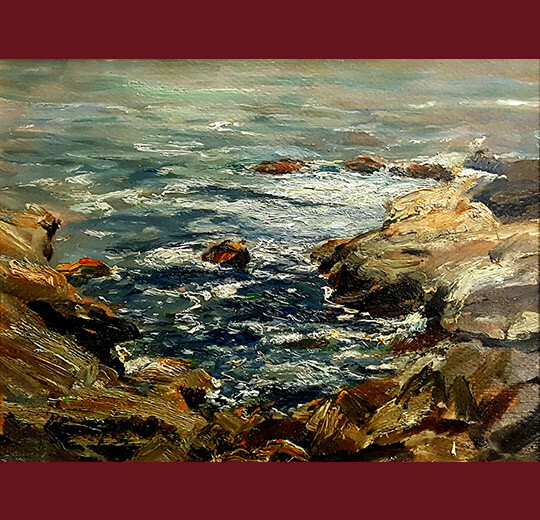 Taken with the California landscape, Peters also studied abroad in Europe–where he first explored the realm of nocturnal paintings that became his signature style. 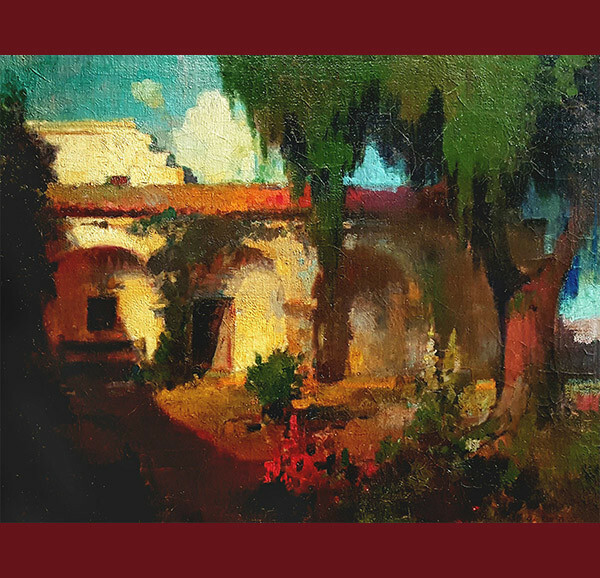 This work, a view of a mission garden, clearly demonstrates his ability to capture mood, color and the full light of day. Benjamin Brown was born in Arkansas in 1865. Despite his parents wishes that he become a lawyer, his heart and soul was one of an artist. He originally trained as a photographer, then expanded his studies to fine art. He studied at the University of Tennessee and then at the Academie Julian in Paris. 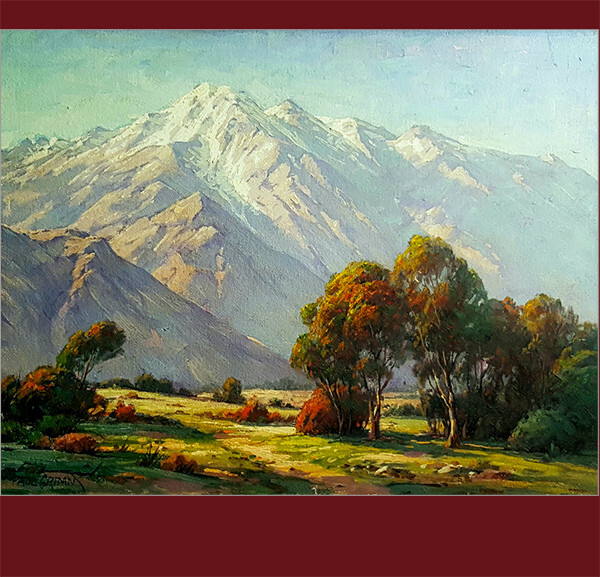 In 1896 he moved to Pasadena, California and discovered his calling in the painting of landscapes. 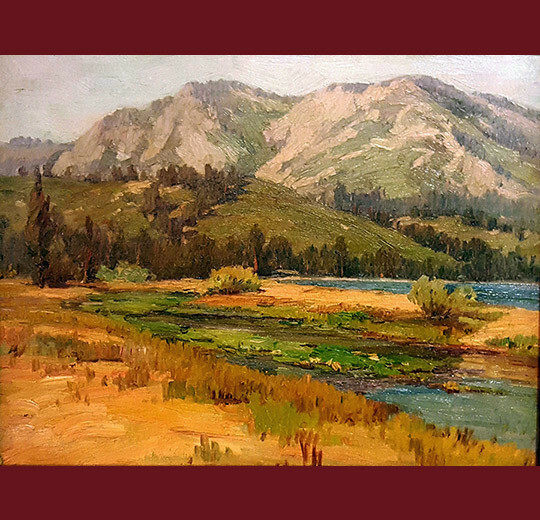 He was a member of several fine artist associations, including the California Art Club. He is best known for his luminous images of California poppy fields and the majestic Sierra Nevada mountains. He also painted in Northern California as well. He died in 1942, still located in Pasadena. 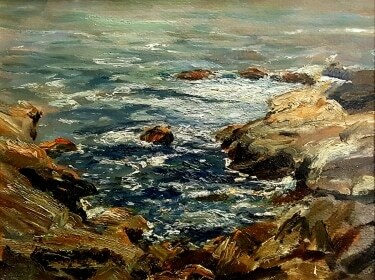 Karl Schmidt was an extremely popular California artist who exhibited widely in galleries and museums. 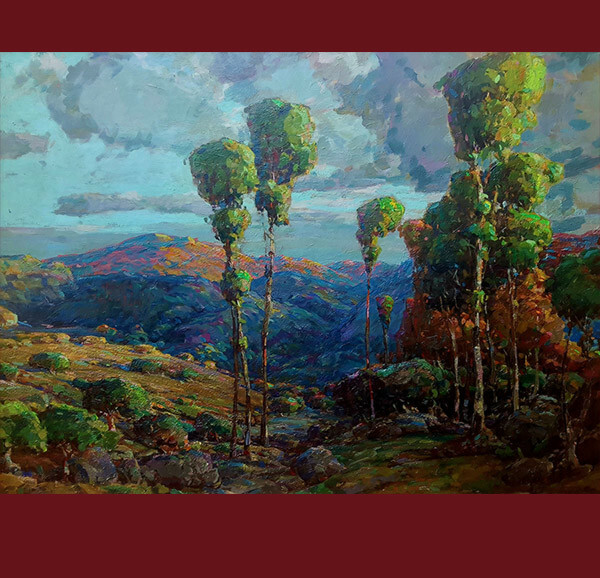 Born in Massachusetts, he found his way to California after time spent painting in England and France. He served in the Navy and was stationed in Pearl Harbor during the attack in December of 1941. He lived in Santa Barbara, when not stationed at Naval Bases, and later moved to Los Gatos where in passed in 1962. His works are known for their bold color and decorative style. Born in Russia, in 1994, into the Jewish community of Belarus. Ben’s given name was Berel Goloschin and as a young man he studied in Art School, along with Yehuda Pen and Marc Chagall. In 1913 he emigrated, along with his family, to New York–where they changed their name to Galos. Ben Galos continued his art studies at the National Academy of Design in New York. He continued to have a successful career, wining multiple awards and exhibiting frequently. New York remained his home until his death in 1963. Alexander Ignatiev was born in Russian, and fled during the revolution, making his way to China. He then came to San Francisco in 1923, living in California until his death in 1995, making his final home in Laguna Beach. He then studied for four years at the Chouinard Art School under Millard Sheets, Phil Paradise, and Lawrence Murphy. He worked as an animator for 50 years, including studios such as Warner Brothers, Hanna-Barbera and Walt Disney. 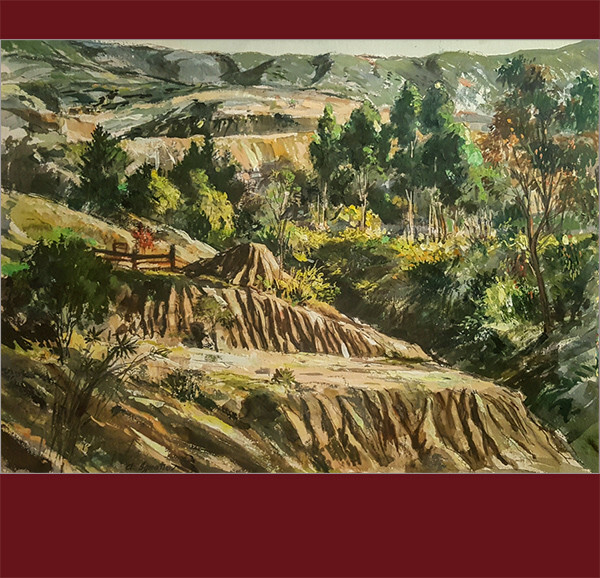 He also was a fine art painter and his talent is well demonstrated in this lovely watercolor of Laguna Canyon. 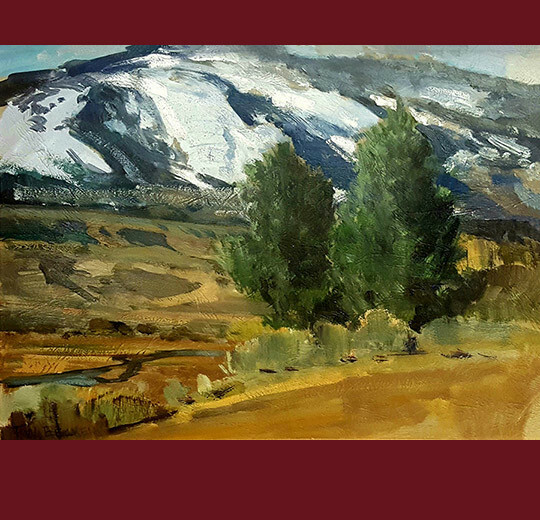 One of California’s best known painters, Paul Grimm is for both his fine desert landscapes and his majestic images of the Sierra Nevada mountains. 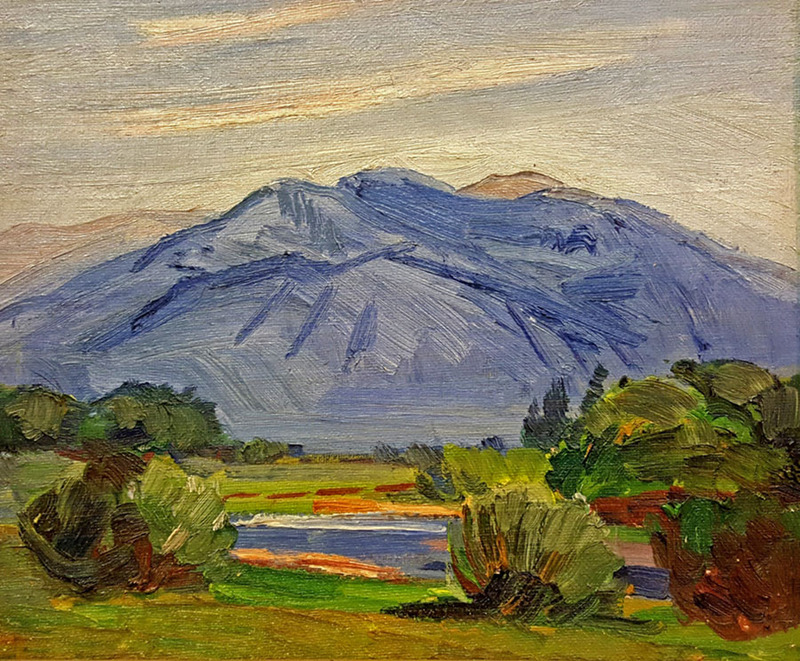 He was a ardent painter of desert scenes and lived much of his life in the Palm Springs area. His desert works are highly appreciated by art lovers and collectors. This particular work of art captures the majesty of the Southern California deserts and foothills with the special light to be found there. 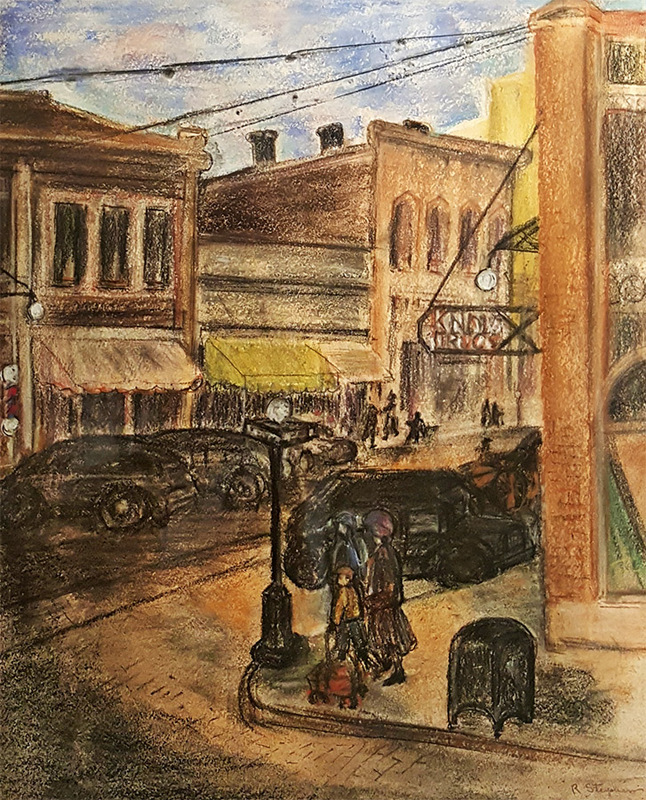 Born in Warrensburg, Missouri in 1886, Thorwald Probst was a painter and illustrator in pen and ink who, as a member of the California Art Club, did “plein air” landscape painting including the Grand Canyon. Thorwald Probst is best known for his mountain landscapes, still life paintings and mission drawings. Bennett Bradbury was born in Massachusetts. His parents were professional classical musicians and he grew up surrounded by such artistic greats as Rachmaninoff, Horowitz and Kriesler. Bennett demonstrated early talent for painting and even earned a scholarship at the age of 15 to the Boston Museum of Art. He is well known for his fine seascapes and coastal scenes and this work is a fine example of his use of brilliant and dramatic color and composition to capture the eye. Morton Dimondstein grew up in New York City, where he attended the American Artists School and the Art Students League. 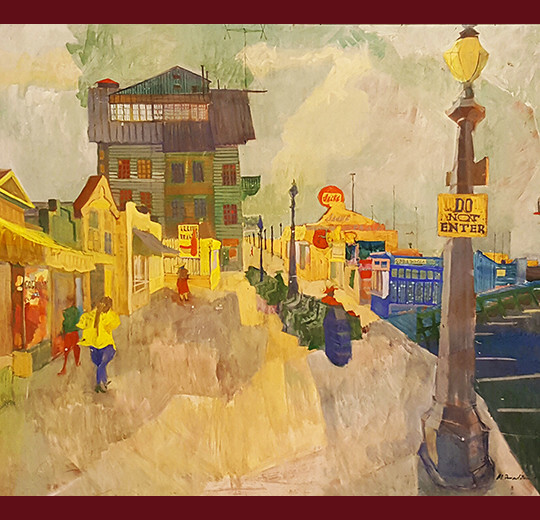 After serving in the infantry during World War II, he moved to Los Angeles and studied at the Otis Art Institute. Influenced by the Mexican muralist tradition, he lived in Mexico City for several years and produced woodcuts that were praised by the great Mexican painter and muralist David Alfaro Siqueiros. Dimondstein also was a sculptor and his paintings and sculptures appeared in many galleries and museums. 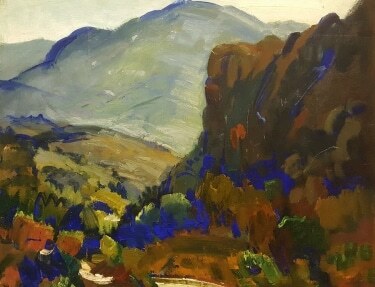 Born in Norway on 1889, Paul Lauritz was exposed to art at an early age, studying with local and foreign artists in Larvik. At age 16 he moved to eastern Canada and had a unsuccessful career as a miner. He found work as a commercial artist in Vancouver and Portland where he began painting landscapes and portraits. His was a long and successful artist’s career and he continued to paint until his death in Glendale, CA in 1975. Frederick Wesley Jarvis was born in Monroe County, Ohio in 1868. Frederick Jarvis became a landscape painter, potter and art educator. He studied at the Art Students League in New York and in Munich, Germany with Franz Mueller. Wesley Frederick Jarvis was best known as an artist for his landscape paintings. 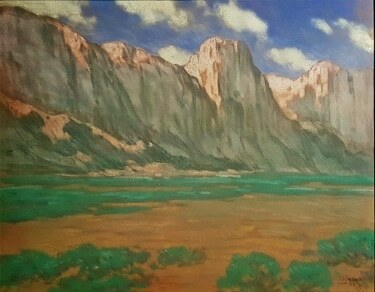 He made painting trips to California, New Mexico and the Grand Canyons. This depiction of the Millard Canyon region brings back an image of the bucolic world of Los Angeles before mass transport and development. Hello, my name is Ron Vander Molen. For over the past 20 years I have devoted my life and my time to works of fine art. 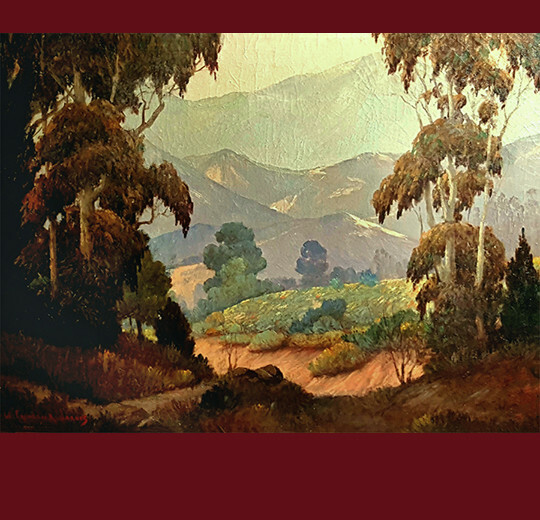 During that time I have maintained a focus and passion for vintage California and American Artists, circa 1890-1940. That era was an intensively creative period for California and American artists, during which they developed their own vision of the Impressionist and other new art movements coming out of Europe during that period. Today those works have found increasing favor and interest with collectors and investors alike. 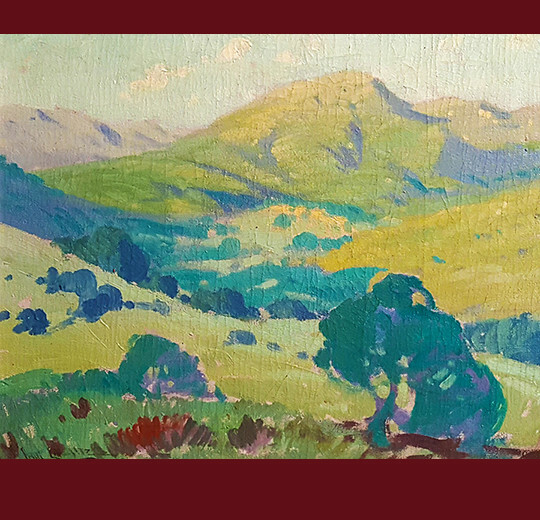 What started as a local gallery has now grown on a much broader scale and we now sell to collectors around the world and have developed a reputation as one of California’s premier destinations and websites for collectors of American and California Impressionism. 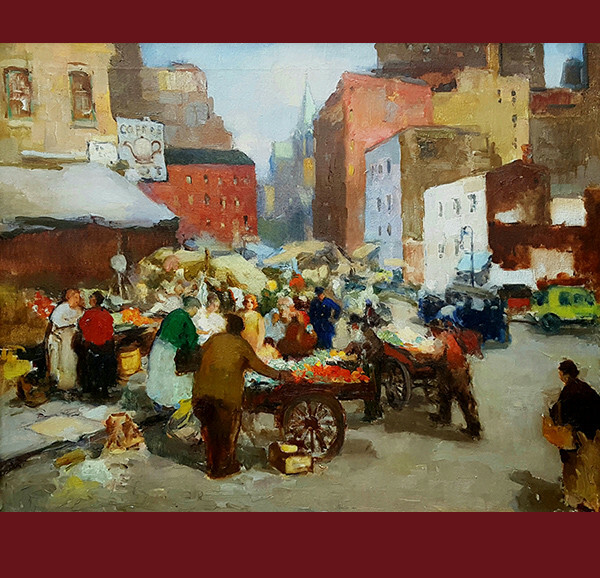 With over 20 years of experience offering a broad selection of quality vintage art, we pride ourselves in offering carefully selected paintings that represent an era of exceptional American art. Naturally all the great artists were once contemporaries and we take great pride in supporting select contemporary artists that display both the talent and spirit that these earlier fine artists possessed and demonstrated. Our mission is to bring fine art to as many individuals, homes and collectors as possible and so we have always sought to offer an affordability level that is unique to the industry, while maintaining a high level of fine quality art. 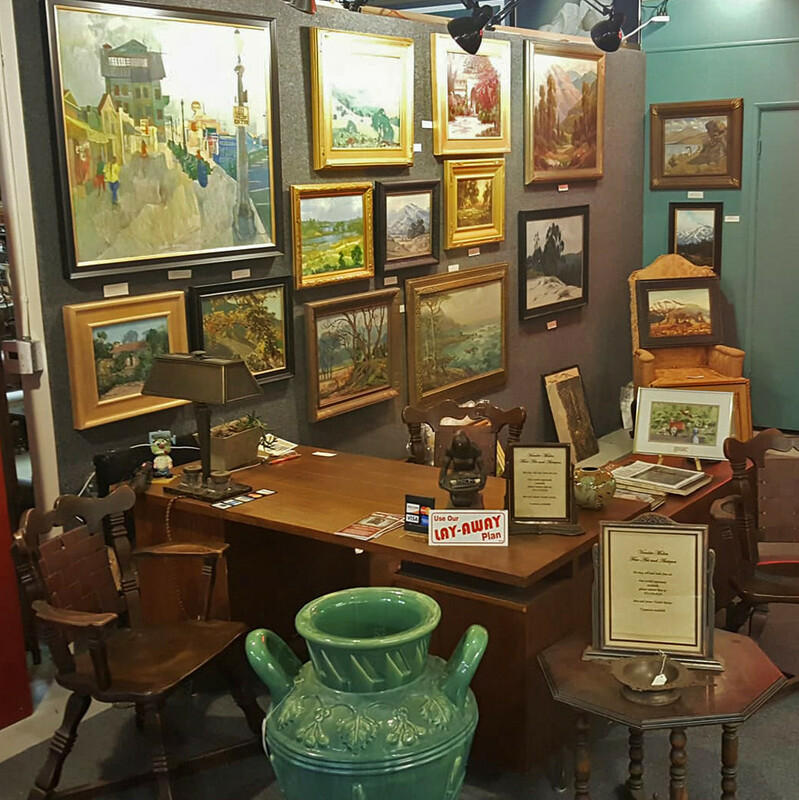 Please enjoy your time on our site, there is quite a bit to see and enjoy, and we invite you to drop by our fine art gallery, located in Pasadena Antiques and Design, 330 South Fair Oaks, Pasadena, CA, to enjoy the beauty of these pieces first-hand. We actively seek new works of art and can assist you in acquiring fine art to suit your needs. Please contact us by phone or email on our contact page. Keep up-to-date with our new acquisitions, art events and of course our amazing estate sales!